"Nariokotome Boy" or "Turkana Boy"
Unfused epiphyses and unerrupted third molars indicate that Nariokotome Boy was still a young adolesent at the time of his death, possibly around 11-12 years of age. Because Turkana Boy died at such a young age, it allows anthropologists to evaluate what kind of developmental trajectory he and other members of H. ergaster followed almost 1.5 million years ago as well as other life history parameters. The nearly complete skeleton on KNM WT 15000 allows paleoanthropologist to relate Turkana Boy’s body shape and stature to his environment. Because body shapes and sizes vary between regions and climates among modern human populations, the measurements from the almost complete skeleton can be used to determine whether Turkana Boy and other H. ergaster individuals’ body shape and size adapted to the hot and arid climate (in accordance with Allen’s rule concerning thermoregulatory principles). Although he was only a juvenile when he died, Turkana Boy stood at 160 cm (~5’4”; based upon measurements from the ulna, femur and tibia) which is still extraordinarily tall when compared to modern human juveniles. KNM WT 15000 body stature, shape and proportions can be described as long and linear; measurements from KNM WT 15000 group accordingly with modern tropical populations who have body shapes and statures that are “elongated” and better suited for thermoregulation in hot, arid, open environments. Turkana Boy’s tall and elongated stature and proportions are directly related to the environment in which he lived. Nariokotome Boy is one of the few fossils with both cranial and post cranial skeletal material. As one of the earliest representative specimens of H. ergaster, anthropologists can study Nariokotome Boy morphology and evaluate how he lived and functioned during his day, and assess any similarities to modern humans. For example, Nariokotome exhibits a similar lumbar and thoracic curvature in the spine, and appears to have a barrel shaped rib cage - all traits indicative of obligate bipedalism. Brown F, McDougall I. 1993. Geologic Setting and Age. In: Leaky R, Walker A, editors. 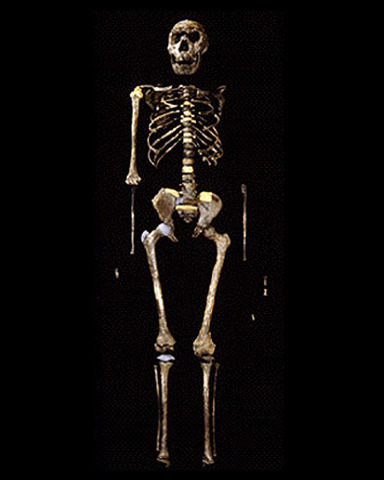 The Nariokotome Homo erectus Skeleton. Massachusetts: Harvard University Press. p 9-20. Smith, BH. 1993. The physiological age of KNMWT 15000. In: Leaky R, Walker A, editors. The Nariokotome Homo erectus Skeleton. Massachusetts: Harvard University Press. p 195-219. Ruff CB, Walker A. 1993. Body size and shape. In: Leaky R, Walker A, editors. The Nariokotome Homo erectus Skeleton. Massachusetts: Harvard University Press. p 234-265. Latimer B, Ward CV. 1993. The Thoracic and Lumbar vertebrae. In: Leaky R, Walker A, editors. The Nariokotome Homo erectus Skeleton. Massachusetts: Harvard University Press. p 266-293. Jellema L M, Latimer B, and Walker A. 1993 The Rib Cage. In: Leaky R, Walker A, editors. The Nariokotome Homo erectus Skeleton. Massachusetts: Harvard University Press. p 294-325. Begun D, Walker A. 1993. The Endocast. In: Leaky R, Walker A, editors. The Nariokotome Homo erectus Skeleton. Massachusetts: Harvard University Press. p 326-358. Graves RR, Lupo AC, McCarthy RC, Wescott DJ, and Cunningham DL. 2010. Just How Strapping Was KNM-WT 15000? Journal of Human Evolution 30:1-13. Klein RG. 2009. The Human Career: Human biological and cultural origins. Chicago: University of Chicago.